For light-duty sweeping. Five rows of stitching. Designed for concrete. Application: concrete; bristle material: corn fiber; handle material: wood; handle diameter: 15/16". 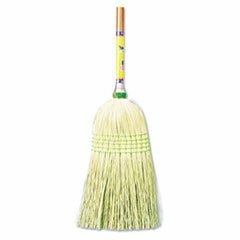 Boardwalk 932CCT Corn Fiber Warehouse Broom, 42 in. Boardwalk 932YCT Corn Fiber Warehouse Broom, 42 in.